Dafnis Prieto, right, alongside Roberto Quintero in rehearsal at Michiko Studios, Aug. 22, 2017. 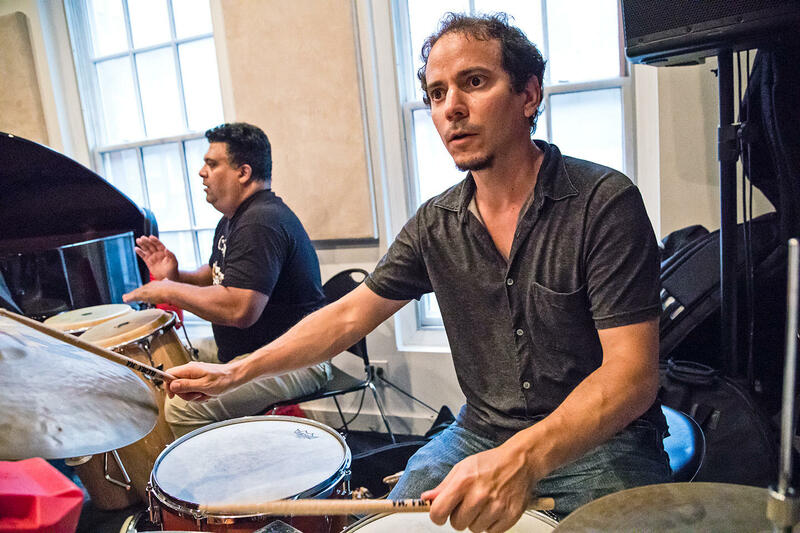 For nearly two decades, the Cuban drummer and composer Dafnis Prieto has been a creative force best measured by the scale of his ambition. A 2011 MacArthur Fellow and the subject of steep critical acclaim, he has never needed a big band to make a big splash. But this weekend Prieto rolls out his first actual big band, featuring collaborators like alto saxophonist Román Filiú, trumpeters Mike Rodriguez and Alex Sipiagin, and pianist Manuel Valera. The world-premiere engagement, Friday through Sunday at the Jazz Standard, doubles as a warmup for the recording studio: Prieto will make this material the focus of his next album, tentatively due out next spring. The Dafnis Prieto Big Band at Michiko Studios, Aug. 22, 2017. Prieto’s concept for this body of music is steeped in tribute: he decided to pay homage to musical figures he greatly admires. 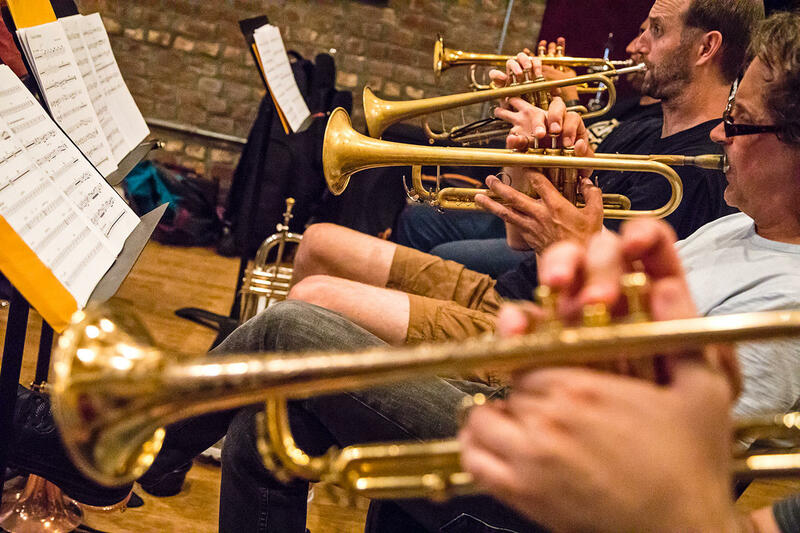 One brand-new composition, “Una Vez Más,” bears a dedication to the master pianist and bandleader Eddie Palmieri and the trumpeter Brian Lynch. There are also a handful of tunes that Prieto originally wrote for a smaller group, like “Prelude Para Rosa” and “The Sooner the Better,” from his decade-old sextet album, Taking the Soul for a Walk. “The character of this album and this project is to bring alive my music, but through a tribute,” said Prieto, who framed the big band scale not as a departure but rather an extension. Here is an excerpt of our conversation. Is this is the first time you’ve done so much work in the big band format? Yes, that’s right. I had done two songs for Arturo O’Farrill’s Afro-Latin Jazz Orchestra – one called “Song For Chico,” and the second one was called “The Triumphant Journey.” We are going to record those two songs with this band, besides everything else I did. I feel like even when you’re composing for a small group, you think in terms of an orchestral palette. So when you actually have 17 or 18 pieces, what’s different about that for you? It was very challenging for me. I’m bringing nine compositions to be recorded; we’re going to play them at the Jazz Standard as well. Some of them are new, and I’m rearranging some songs that were played by my quartet or the sextet. Believe it or not, the rearranging of the old songs has been more challenging to me than making up a completely new song for the band. Is that because you had a picture already in your head? What happens to me when I write something, even a piece for the quartet, is that I have a sense of a completeness, on a compositional level. And now, I have to amplify that – I have to bring that to a new dimension with the different sounds. That was the hardest part for me, to rearrange the material and make it sound coherent for a bigger instrumentation. That was more challenging than bringing a new song off the top of my head. But the whole thing is a challenge. I think my aim is to really bring different textures and different sounds, and I would like to believe that they are new sounds, for a big band. With Arturo’s band, for instance, there’s a very clear precedent that he’s extending – the example of his father, Chico O’Farrill. It strikes me that your mission is a little different, that you’re not thinking in terms of a lineage. What does the precedent mean to you, here? I am not trying to sound like any other big band but my own. Obviously, I heard the classic big bands, like Duke Ellington’s, and also the Latin big bands, like Chico and Mario Bauzá. But I see this big band as an extension of myself as a composer – just in a bigger room, in a way. I’m not really thinking “I want to sound like this big band,” like Count Basie or Duke or any of these other bands. They have their own specific sound and their own specific strategy. I’m trying to also create my own strategy and sound, so that it comes out as myself. Trumpet section of the Dafnis Prieto Big Band, Aug. 22, 2017. Is the core of this group the rhythm section, as a foundation over which everything else is built? The rhythm section is a very strong part of it. But there is a lot of material where the strength of it comes from the melodic or harmonic aspect of it. We’re playing a ballad which, in the recording the melody is going to be played by Henry Threadgill. But it’s like a bolero, so rhythmically there’s not really that much to it. So I tried to get the thickness of the band through the harmony and through the melodic aspect of the counterpoint. Obviously, there is a great deal of strength in the rhythm section, but there is a lot of other things going on. 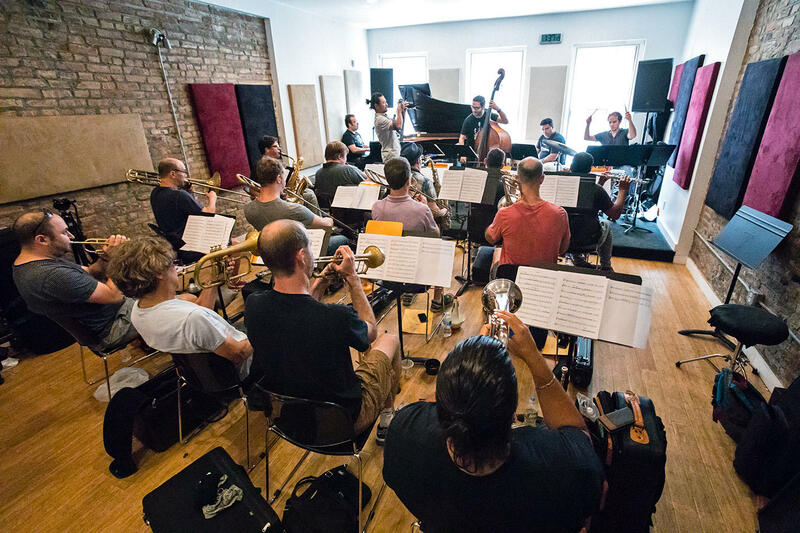 The Dafnis Prieto Big Band appears Friday through Sunday at the Jazz Standard. For more information about his new project, visit dafnisprietobigband.com.